Don’t let an Infestation ruin your summer. Prevention is key! Summer is here and fleas and ticks are in abundance. Although they may not always be visible, fleas and ticks live all around us. They’re in our lawns, shrubs, in our sandy soil and unfortunately, sometimes on our pets. If the latter part of that statement sounds a little too familiar to you, then your pets are in need of some serious help…and quick! Fleas and ticks can be dangerous to humans and even more so to pets. Can you imagine walking around all day long with tiny bugs constantly sucking your blood? One flea can bite up to 400 times in a day. (OUCH!) What’s worse is that not only do fleas and ticks feed on our pets but they also transfer deadly diseases, such as Lyme disease. Take a look at the informative chart below to read facts about fleas and ticks, the differences between the two and the variety of diseases they can spread. If you have pets, it’s imperative, for your health and theirs as well, to be proactive and seek proper pest control treatment for your home and lawn. Also, if you think that you may have a flea or tick infestation, an inspection and professional treatment is critical to rid your home of these pests. Don’t wait until it’s too late, prevent a flea and tick infestation in your home and keep your family and pets safe. 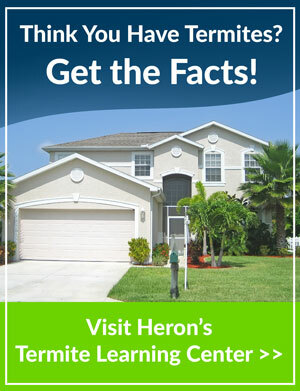 Call 1-800-81-Heron TODAY if you have any questions or if you would like to schedule your FREE Same Day inspection.